Agricultural gene banks will cease from simply serving as storage of plant seeds, but will now be used to find traits that can be utilized to develop better crop varieties. The new initiative, called DivSeek aims to unlock the potential of crop diversity stored in gene banks around the world and make it available to all so that it can be used to improve productivity, sustainability and resilience of crops and agricultural systems. DivSeek is an effort of an international consortium of 69 public sector partners, including CGIAR Consortium of International Agricultural Research Centers. Read more at http://www.divseek.org/ and http://news.sciencemag.org/biology/2015/01/divseek-aims-mine-genetic-treasure-seed-bank-vaults. The National Academy of Sciences conducted a two-day workshop on how to communicate about genetically modified organisms (GMO) to the public. The workshop was held on January 15-16, 2015 in Washington, DC. The workshop was attended by life science researchers and featured speakers who are experts on science communication. The speakers, including Dietram Scheufele of University of Wisconsin-Madison, presented strategies on how scientists can improve engagement based on the findings of social scientists. Break-out sessions were also held to discuss different issues on GMOs such as GM corn and its effects on Monarch butterflies, American chestnut, and GM mosquitoes. For more information, read USDA's news release and associated documents at http://goo.gl/4BnVTp. Cotton Leaf Curl Virus (CLCV) was the largest impediment to cotton maximization which has been overcome to some extent in Pakistan, but it is still a hurdle for high yield of cotton crop. Sources at the Ministry of Textile Industry said that the government has taken various measures to upgrade cotton production. CLCV resistant varieties of GM cotton developed by Pakistan Central Cotton Committee (PCCC) and other public and private research system were being evaluated for release. CLCV issue is being confronted through a Pak-US Cotton Productivity Enhancement Programme with intent to strengthen national cotton research and development (R&D) system especially for the development of virus resistant varieties of GM cotton. A new research station in Lasbela in collaboration with Lasbela University of Agriculture Water and Marine Sciences is facilitating cotton cultivation in Balochistan. Field staff of Agriculture Department of KPK and Balochistan were trained at Multan and Faisalabad in cotton production technology. Bt cotton varieties were developed and released following the regulatory system. To increase the cotton fiber quality, a cotton ginning institute is being established in Multan to produce world class quality fiber from cotton. All endeavors have been undertaken by the government to ensure high level of cotton production. Read the research article at http://link.springer.com/article/10.1007%2Fs11427-014-4768-1. An interdisciplinary team from the United Kingdom, France, and Switzerland, has produced real time images of what happens when plants beat off insects and respond to disease and damage. Their research, published in Nature Communications, focused on the plant hormone jasmonic acid, a defense compound which is released during insect attack and controls response to damage and disease. Prof. Malcolm Bennett, from The University of Nottingham, said: "Understanding how plants respond to mechanical damage, such as insect attack, is important for developing crops which cope better under stress." The team created a special fluorescent protein called Jas9-VENUS that is rapidly degraded after jasmonic acid is produced. This allowed them to monitor the plant part/tissue where jasmonic levels increased as the fluorescent signal is lost. The research team mimicked insect feeding on a leaf by using a blade to damage it. With the fluorescent protein they were able to take images of how damage to a leaf quickly results in a pulse of jasmonic acid that reaches all the way down to the tip of the root, at a speed of more than a centimeter per minute. Through the images, they saw that once this hormone pulse reaches the root it triggers more jasmonic acid to be produced locally, amplifying the wounding signal and ensuring other parts of the plant to prepare for an attack. Tropospheric ozone (O3) is a secondary air pollutant and a greenhouse gas that can damage plant productivity in high concentrations. Soybean (Glycine max L. Merr.) is a crop sensitive to O3 and current ground-level O3 concentrations are estimated to reduce global soybean yields significantly. 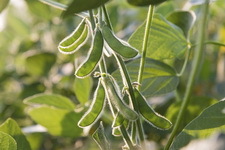 To understand transcriptional mechanisms of yield loss in soybean, Elizabeth Ainsworth from the University of Illinois examined the transcriptome of soybean flower and pod tissues exposed to elevated O3 concentrations. Elevated O3 caused strong transcriptional responses in flower and pod tissues, with increased expression of genes involved in signalling in both tissues. Flower tissues responded by increasing expression of genes encoding matrix metalloproteinases (MMPs), which are involved in programmed cell death, senescence and stress response. On the other hand, pod tissues responded by increasing expression of xyloglucan endotransglucosylase/hydrolase genes, predicted to be involved with increased pod dehiscence. This study established that gene expression in reproductive tissues of soybean are affected by elevated O3 concentrations, and flowers and pods have distinct transcriptomic responses to it. For more information on the study, read the full article here: http://www.biomedcentral.com/1471-2229/14/335. Fusarium head blight (FHB) is a major fungal disease in durum wheat caused by Fusarium gramineum. FHB infected durum wheat suffers grain yield losses and reduced quality. 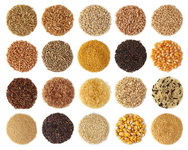 With this problem, researchers from Sapienza Università di Roma, University of Bari "Aldo Moro" and Iowa State University conducted a study on durum wheat to increase its resistance against the disease. This was conducted by examining and comparing an FHB resistant common wheat (Triticum aestivum L.) and durum wheat to identify the traits associated with FHB resistance. Their findings suggest that the FHB resistant common wheat does not share similar cell wall traits with durum wheat. These differences were observed in the lignin monolignols composition, arabinoxylan substitutions and pectin methylesterification. The presence of WheatPME1, a gene identified in the pectin methylesterification, was found to be the main gene involved in FHB resistance. These results will help in developing durum wheat with resistance against FHB. The development of superbugs becomes an issue due to its threats to human health. This is due to the increased antibiotic resistance of certain infectious organisms such as bacteria affecting the safety of animal and the quality of its products. With this, Colorado State University researchers, Dr. Paul Morey and Dr. Keith Belk are leading the study of the process and mechanism involved in the development of superbugs in beef and dairy cattle industry. This will be conducted using DNA sequencing technology. The use of this technology will help in understanding how antibiotic resistance is developed and transferred from livestock to humans. Comparisons between the traditional and organic process under different environments will be done to further identify the resistant genes and mechanisms associated with it. The production systems involved in the livestock industry will also be examined to assess whether it can trigger antibiotic resistance. The Plant Genomics Congress: Asia. Kuala Lumpur, Malaysia 19-20 March 2015 Agenda out now! Since the Plant Genomics Congress was first launched, 1,500 people have attended this meeting on three continents. These meetings have been noted both for the quality of the scientific content of the presentations and for the opportunity to network with leading plant scientists from academia and industry. See how the 2015 agenda lives up to these exacting high standards here. Readers benefit from a 10% discount with code "CBU/10". 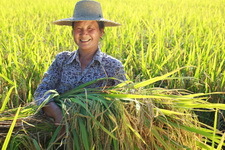 For more details contact nnoakes@globalengage.co.uk or visit http://www.globalengage.co.uk/plantgenomicsasia.html. The World Congress on Root and Tuber Crops (3rd Scientific Conference of the Global Cassava Partnership for the 21st Century (GCP21) and 17th Symposium of the International Society for Tropical Root Crops) will be held in Nanning, China on October 5-10, 2015. For details on registration, program, and accommodation presented at the second announcement, visit http://www.congressrtc-nanning.cn/. The Belfer Center for Science and International Affairs has released a discussion paper "Taking Root: Global Trends in Agricultural Biotechnology", authored by Calestous Juma and Katherine Gordon, Director and Project Coordinator, respectively, of the Science, Technology, and Globalization Project at Harvard Kennedy School. The paper reviews the evidence on global trends in the application of agricultural biotechnology and identifies some of their important benefits. The paper is cognizant that biotechnology alone cannot solve the world's agricultural challenge, and though it is not a silver bullet, it should still be included in the package of technological options available to farmers. The evidence available today suggests that public policy should appeal more to pragmatism and less to ideology when seeking solutions to global agricultural challenges. The paper is available for download at http://belfercenter.ksg.harvard.edu/files/TakingRoot.pdf. For more details, read http://belfercenter.ksg.harvard.edu/publication/24899/taking_root.html?breadcrumb=%2Fpublication%2Fby_type%2Facademic_papers_reports. The National Agricultural Library (NAL) launched PubAg, an online database of published research conducted by US Department of Agriculture scientists. PubAg contains over 40,000 scholarly articles released from 1997-2014. PubAg has been designed to be easy to use and to serve diverse users including the public, farmers, scientists, academicians and students. PubAg is free to use, and there is no need to create an account to use the search engine. Ag Biotech Vietnam, in collaboration with the Faculty of Biology and Chemistry of the Northwestern University, organized a biotech quiz contest bearing the theme "Learning the biotechnology applications in agriculture 2014 ". The contest had two components: multiple choice test and ideas presentation. Contest participants include students from Faculties of Biology and Chemistry, Agriculture and Forestry; Chu Van An Secondary School; and the College of Son La. The first component took place on December 14, 2014 in Northwestern University participated by nearly one thousand contestants. The second component and awarding took place in the same venue on December 20, 2014. The awarding ceremony was attended by Prof. Dr. Le Huy Ham, Director of the Institute of Agricultural Genetics; Dr. Nguyen Trieu Son, Vice Rector of the University of Northwestern; Dr. Pham Van Nha, Head of the Faculty of Biology - Chemistry; Dr. Vu Quang Giang, Head of the Faculty of Agriculture - Forestry; MSc. Duong Thi Duyen, Vice Principal of Chu Van Anh Secondary School; and representatives from Ag Vietnam Vietnam. The organizers handed over 20 awards to individuals and groups. Nguyen Thi Thu Hoai, K52 of Faculty of Biology and Chemistry won the first prize for multiple choice test and Ha Trong Hoang from Faculty of Geography and History took the first rank in the ideas presentation. Prof. Dr. Le Huy Ham also delivered a talk on genetically modified crops and answered many questions from the audience. For more information about biotechnology in Vietnam, contact ldlinh@gmail.com. 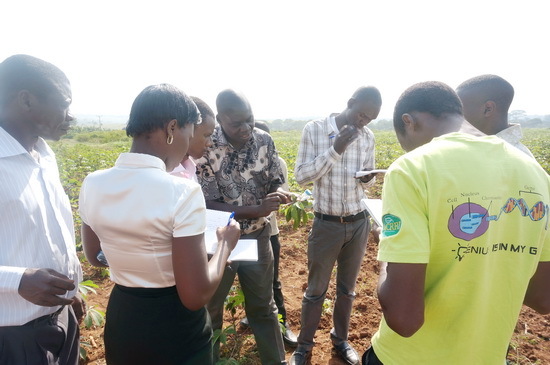 Uganda Biotechnology Information Center (UBIC) organized a one-week biotechnology internship programme for students from secondary schools and tertiary institutions who submitted winning essays in the National Biotechnology Essay Writing Contest in 2014. The activity was held from January 11-16, 2015. The key objective of the one-week training was to introduce the students to practical aspects of biotechnology through rigorous sessions on laboratory and field protocols for conducting biotech research. Students were also given an opportunity to learn about new advances in crop and agricultural research, including genetic engineering. The students attended theoretical and practical sessions on molecular biology, plant transformation, and regulatory aspects of GM research. At the end of the training, the students expressed their gratitude for the opportunity to work with the scientists at National Crops Resources Research Institute (NaCRRI). For more information, write to ubic.nacrri@gmail.com.